The Royal Edinburgh Military Tattoo is one of the most spectacular shows in the world, enjoyed by an international television audience of 100 million viewers. However, seeing the show live on the Esplanade of Edinburgh Castle during the three-week season in August is a thrilling experience. Massed bands from Scottish Regiments and from all over the world put on an extraordinary performance. Prime tickets to this event are included! On this fully escorted tour you will enjoy the perfect combination of two great countries in one itinerary. Start in Glasgow before exploring the Scottish Highlands with a Loch Ness cruise and whiskey tasting. 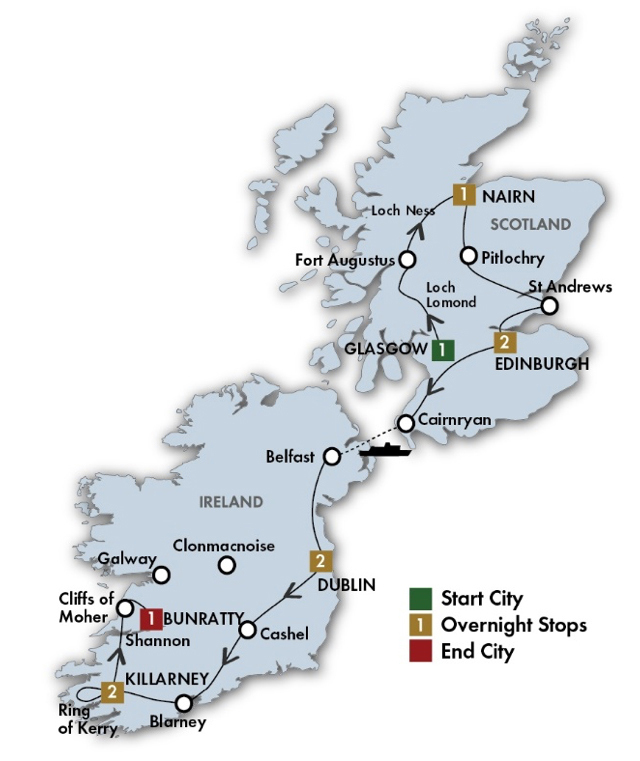 Visit St Andrews and Edinburgh, take a quick ferry ride to Ireland and get to know the southern part of Ireland, including Dublin, Blarney, Killarney and the Cliffs of Moher. ALL SIGHTSEEING IS INCLUDED! Tour begins at 2:30 PM at your Glasgow hotel. Set out on an introductory tour of central Glasgow — a city that flourished in Victorian times due to the shipbuilding industry and international trade. Drive around George Square with its ornate City Chambers, and visit Provand’s Lordship, Glasgow’s oldest house. Enjoy a welcome drink with your group before dinner. Travel alongside the famous Loch Lomond, renowned for its unsurpassed beauty. Drive across the haunting Rannoch Moor and through Glencoe, admiring the wild and spectacular scenery. Continue through Fort William and stop at a woolen mill to shop for quality Scottish goods. Embark on a short cruise on Loch Ness before heading to Nairn. Explore the principal sights of central Edinburgh from the bustling Princes Street and through the gracious, wide streets of the 200-year-old Georgian “New Town.” Walk along part of the Royal Mile where compact medieval houses reach 11 floors tall. Visit Edinburgh Castle perched high above the city on a volcanic rock. The castle contains the Scottish Crown Jewels and the Stone of Scone. The balance of the day is free. 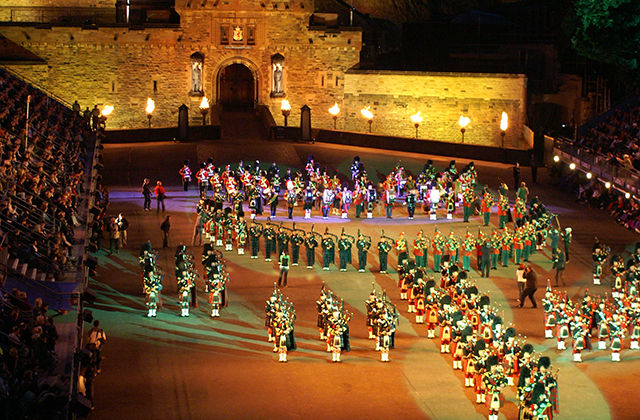 The July 30 – August 20 departures watch the spectacular Royal Edinburgh Military Tattoo on the Castle Esplanade. Discover central Dublin with a local guide. See the shopping areas around Grafton and Nassau Streets, view elegant Georgian squares, and the General Post Office, where the 1916 Uprising started. Take a walk around Christ Church Cathedral founded in 1028. Board a former Guinness barge for a canal dinner cruise complete with traditional Irish music. Travel through the midlands of Ireland, stopping for photos at the stately Rock of Cashel. Immerse yourself in farm life with tea and scones at a farmhouse visit and watch skilled dogs herd sheep. Head to Blarney Castle and kiss the famous “Stone of Eloquence.” Treat yourself to Irish goods at the Blarney Woollen Mills before heading to Killarney, picturesquely set beside lakes and mountains. Step back in time as a jaunting car drives you past Ross Castle set on Lough Leane. Embark on the Ring of Kerry drive — a winding route with breathtaking sights of mountains and coastal views. Cross the bridge to Valentia Island to visit the Skellig Experience, which explains the life of early Christian hermits on Skellig Michael, a rocky offshore island featured in the film “Star Wars VII.” Enjoy a casual lunch and later stop in the pretty village of Sneem. Pause at Moll’s Gap for panoramic mountain views and return to Killarney where the evening is free. Take in the enormity of the Cliffs of Moher, a spectacular wall of sandstone that reaches 700 feet above the Atlantic, as you ferry across the River Shannon. Walk along the Cliffs for stunning views. Later, at Bunratty Castle Hotel, you’ll have free time to visit the Folk Park, have a drink in the 200-year-old Durty Nelly’s Pub, or shop at the Bunratty Mills independently. In the evening head for a memorable medieval-style feast where the lords and ladies will serenade you with song and harp music evocative of the Middle Ages. A deposit in the amount of $250.00 per person is required at the time of booking. Due to the limited availability for Tattoo Tickets we recommend you secure your reservation as soon as possible. Airfare pricing will be available mid-September 2018. Travel protection is optional and strongly recommended at $319.00 per person. Final balance is due April 26, 2019.